We all know that nostalgia can play tricks with us, the music of our youth was better than todays, the culture we associate with the years when we are actively involved in it will always better the decades when you are less involved or not involved at all. But I don’t think that its an exaggeration to say that Rock Against Racism (RaR) was unique. Never before or since has an organic mass movement, free of central control, based on popular culture, actually had such a political effect. RaR and its sister organisation, the Anti-Nazi League (ANL), took on and defeated the rising threat of the National Front in the 1970s and 80s. The reason for the clear and simple focus of RaR was that it emerged from a clear and simple reaction a situation that occurred within the rock scene. David Bowie had expressed his sympathy for fascism and gave a nazi salute after alighting from a train in London in 1976. Then blues guitarist Eric Clapton peppered a London gig with his views in support of Enoch Powell’s infamous “rivers of blood” speech and constant rants about immigration. Some, in the rock community were appalled. 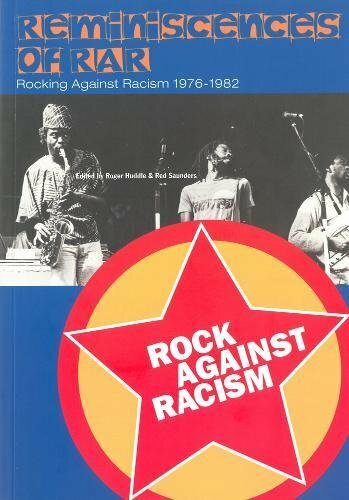 Red Saunders, one of RaR’s founders and co-author (along with Roger Huddle) of Reminiscences Of RaR, Rocking Against Racism 1976-1982 took a straightforward action. He wrote to the music press expressing his disgust at Clapton’s words. To Saunders, Clapton had built his career playing black music, he had recorded Bob Marley’s “I shot the Sheriff”, the letter was co-signed by a group who would be the inadvertent founders of a mass movement, there was a PO box number to respond to. They envisaged that some in the pub rock community would put on a few gigs in small venues. What happened was that, as well as RaR organised Carnivals in cities across England, people just did it themselves, photocopied the RaR and ANL logos and did their own thing in their home towns. Pubs and halls across the UK held gigs in support featuring local punk, rock and reggae bands. In Scotland, apart from the many small local gigs, there were larger festivals in Parks. At the Clydeside bandstand in Glasgow, Ferguslie Park in Paisley and Craigmillar in Edinburgh. 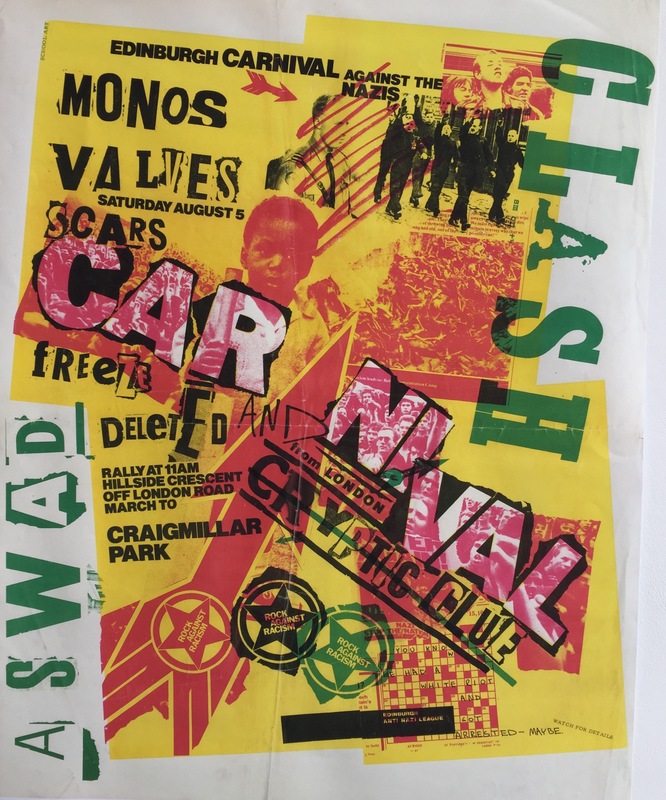 The Craigmillar gig was infamous for including the Clash on the posters. The Clash failed to appear or, more likely depending on who you believe, were never booked in the first place. Jim Main, still an anti-racism activist, was a teenager when he attended the Paisley Rock Against Racism Carnival. And Main believes the the effects were lasting, the concerts left a real legacy. While local bands and organisers were doing their own thing, the huge Carnivals in the cities attracted the biggest names in punk and New Wave – Elvis Costello, The Clash, X-Ray Spex, The Specials, the played side by side with the biggest names in British reggae, Aswad, Misty, Steel Pulse, Black Roots. RaR gave space to a generation of political music as well as bringing people together to dance and party in unity. Tom Robinson Band’s “Glad To Be Gay” became a youth anthem. Trudy Howson, the inaugural LGBT Poet Laureate, was a member of some of the bands who played the RaR concerts including The Hackney Hot Taps and The Doris Gay Sisters. “The reason I was attracted to Rock Against Racism was because it was a sound political philosophy mounted on music. I also felt I was able to make (small) amends for some of things I had witnessed when I was living in Lancashire. I felt RaR could make a difference to the way people thought and acted. Its events felt like a party, it made politics fun”. The final Carnival was in Leeds in 1981, featuring The Specials, Misty, Aswad and the Au Pairs. Forty years on from the historic movement, a concert is being staged in celebration at the historic Queens Park Arena in Glasgow’s Southside. GOVANHILL AGAINST RACISM is a two-day event held in the newly refurbished Queens Park Arena. On Sunday 27 August, legendary British reggae bands Aswad, Misty in Roots and Black Roots play Roots Rock Reggae Against Racism and Black Grape headline Rock Against Racism on Monday 28 August, with Colonel Mustard & The Dijon 5, and Glasgow Beatboxer and MC team Bigg Taj vs Spee Six Nine. The concerts, organised by Alistair Hulett Memorial Trust, ends a weekend of events celebrating unity, diversity, and the community of Govanhill, Scotland’s most ethnically and culturally diverse area. Glasgow Unity Festival is a three day conference from 25-27 August organised by Inhouse, and Govanhill International Carnival, organised by Govanhill Baths, is a parade and family day on Saturday 26 August. The Parade through Govanhill ends at the Arena where First Minister Nicola Sturgeon will open the Carnival that will feature St Francis Gorbals Pipe Band, Southside brass ensemble Brass Aye! The Sistema Big Noise Orchestra, The Unite Fight Sing Socialist Choir and Govanhill based Gypsy Jazz band E Karika Djal with traditional Roma dancers from Poland. The range of speakers at the Festival include original campaigning members of RaR and ANL including Jeremy Corbyn and Aamer Anwar. The ANL continued for many years after RaR, Aamer Anwar was their organiser in Scotland. Other speakers at the Festival include Zandra Yeaman of the Coalition for Racial Equalty and Rights (CRER), Gozie Joe Adigwe of STUC Black Workers Committee and Charlotte Ahmed of Unite Against Fascism,who, as a teenager, travelled from her Yorskhire home the famous Manchester and Leeds Carnivals. Jim Monaghan is a poet and political activist from Govanhill, he is one of the organisers of Govanhill Against racism and Arts Coordinator at Govanhill Baths Community Trust. The Hackney Hot Taps? I was very involved in Hackney RAR, and don’t remember any band of that name. Do you mean the Harmonettes (see https://womensliberationmusicarchive.co.uk/h/)? Mind you, when I think back on it, some bands then literally lasted for only one or two gigs – so that may account for it. Apologies.